9 stories above Salisbury Road you can’t hear the noise of the street below, but even with the blinds of your hotel room shut the light from Hong Kong seeps through the cracks, leaking water into the ship of your subconscious as it charts a course across the nighttime dreamscape. This might explain why I woke up at 4:20 AM, bleary-eyed yet alert. My dad and I had spent the past 2 days in Hong Kong and were leaving that day to Shanghai, and my body was not adjusted to the time difference. As I slipped out of bed and pulled on my shoes, Dad mumbled something about the time, and I told him I was going out for a week. 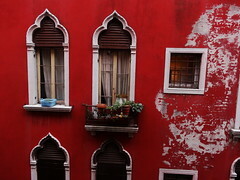 I took my camera with me and stepped out of the room. The lobby of the Sheraton was empty but for one attendant woman at the reservation desk and another quietly mopping the marble floors. The fluorescent lights seemed harsher without the constant rush of humanity to deflect their glare. 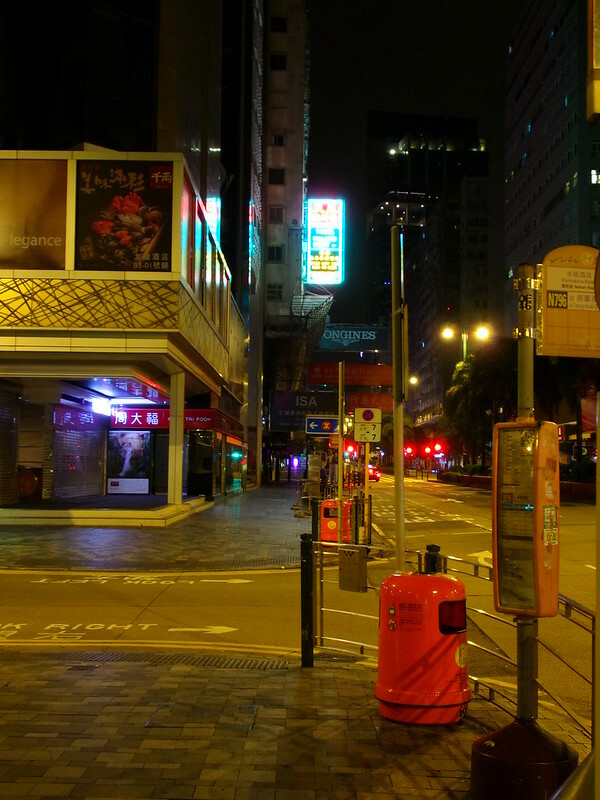 I took the escalator to the ground floor and emerged into the predawn darkness of Kowloon, with Hong Kong’s pointy skyline stabbing upwards. 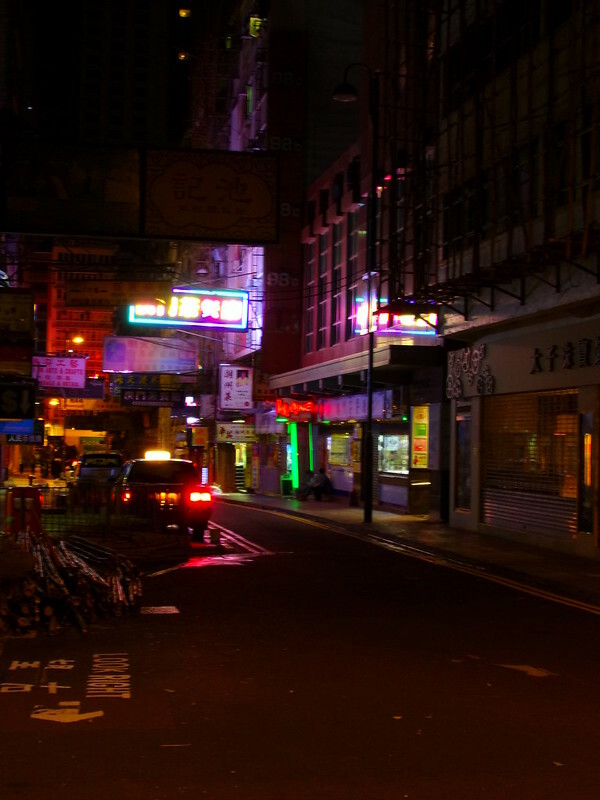 But for a red taxi idling near the waterfront, Kowloon was empty. 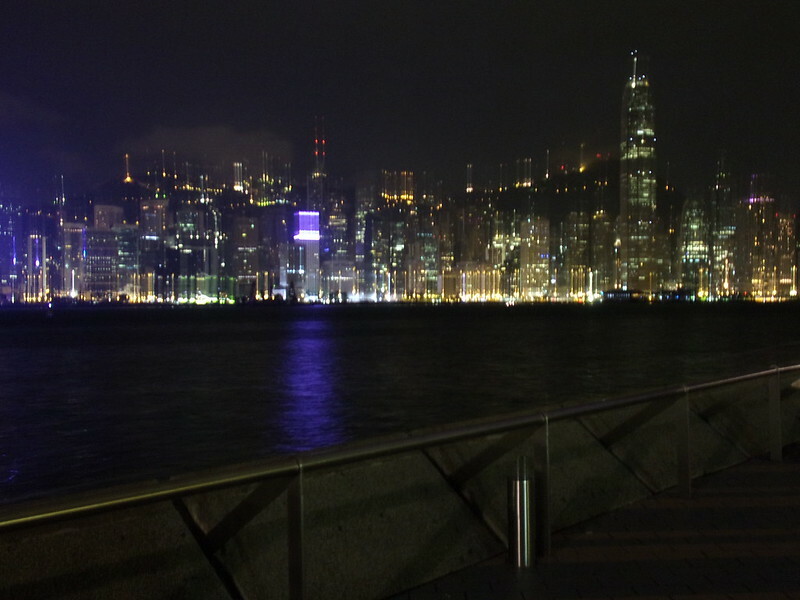 I crossed the street from my hotel and stared up at Hong Kong, a dark fabric of glass and steel pricked with thousands of tiny points of yellow and blue light. It was mid-November and the air was damp but warm. I turned away from the shore and began walking up Nathan Road, the main north-south artery in Kowloon, my back to Hong Kong. It was just early enough for the first crowd of workers to begin their daily migration to work, and I passed a bus stop with one or two people waiting silently and staring off into space. A large park straddles a mosque along Nathan Road, and I darted left off and onto a street running parallel to the park. Incomprehensible Mandarin lighting scoured the street in wild shades of purple, pink, and green. 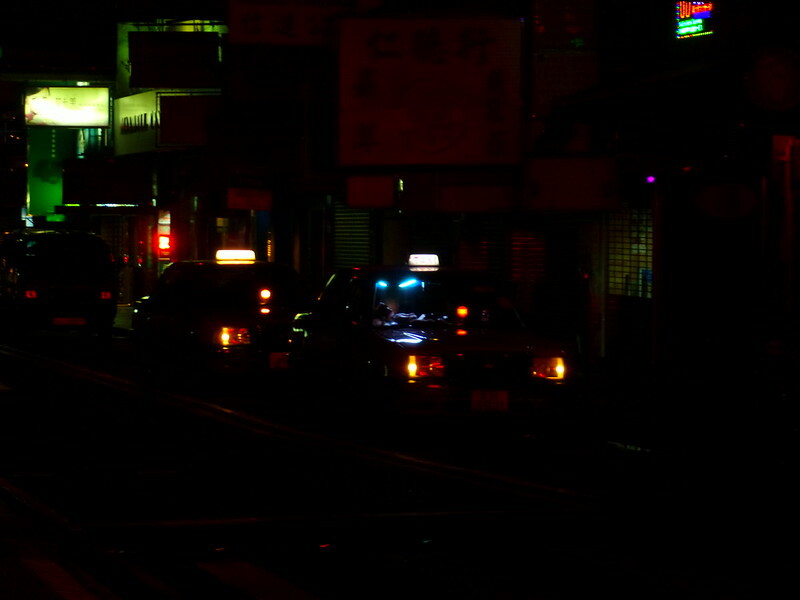 Two taxis were parked with their headlights dimmed. I stood watching them, the sleeping cab drivers bathed in neon halos, resting in the stomach of the night for at least another hour or so. 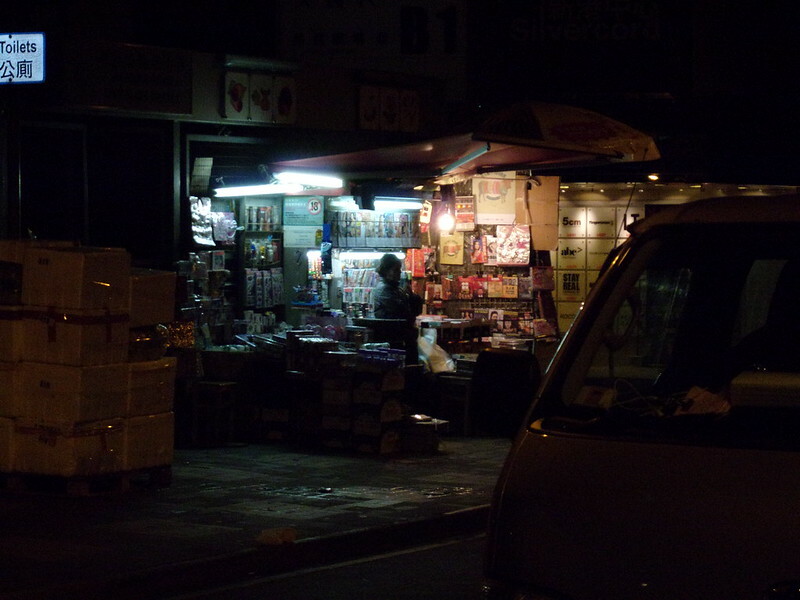 Not far down the road was a newstand lit by harsh halogen lights. A woman with deep creases beneath her eyes glanced up at me as I passed by. She was slouched backwards on a hard plastic stool; her weary face was surrounded by screaming Chinese tabloids and piles of newspapers, and she blinked slowly, as if to keep them at bay. My feet carried me some arbitrary distance–I stopped paying attention to where I was going. Down one quiet street, then another. Neon lights everywhere. Parked cars silent sentry of empty streets. 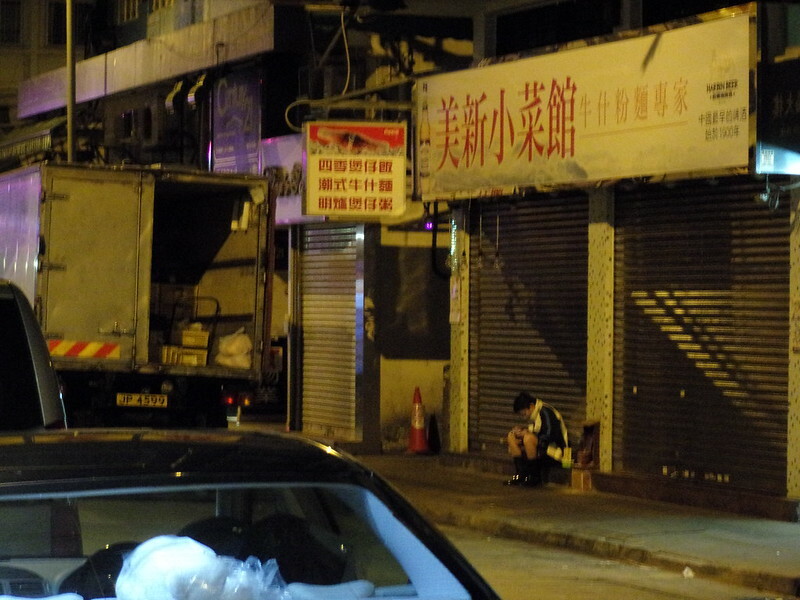 Around one corner I saw a man squatting on the curb next to a box truck, presumably waiting for his work to start the day. 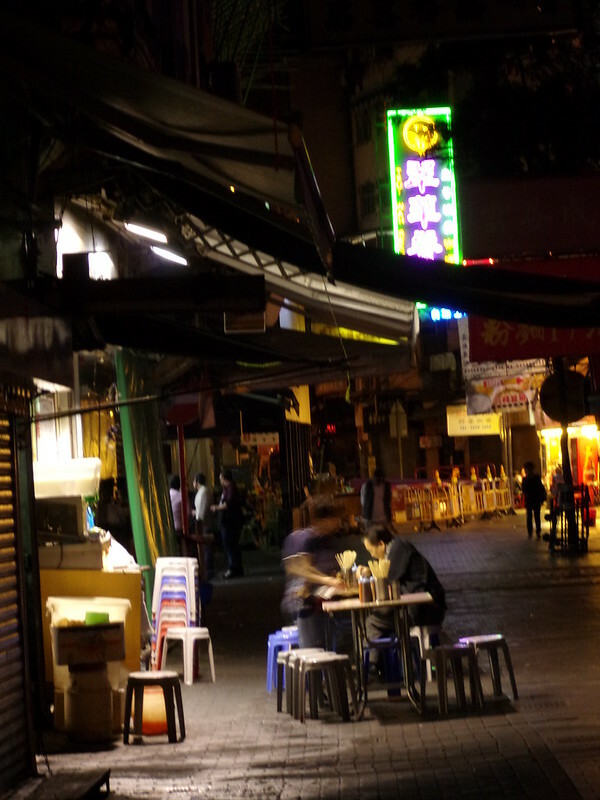 Down a dimly lit corridor of mostly shuttered massage parlors and storefronts I glimpsed a man slurping noodles at a streetside table. The woman serving him bent over his table to clean up a splash of broth, then bustled back into her cubicle-sized kitchen, steam and the bitter aroma of cooked meat wafting upwards. 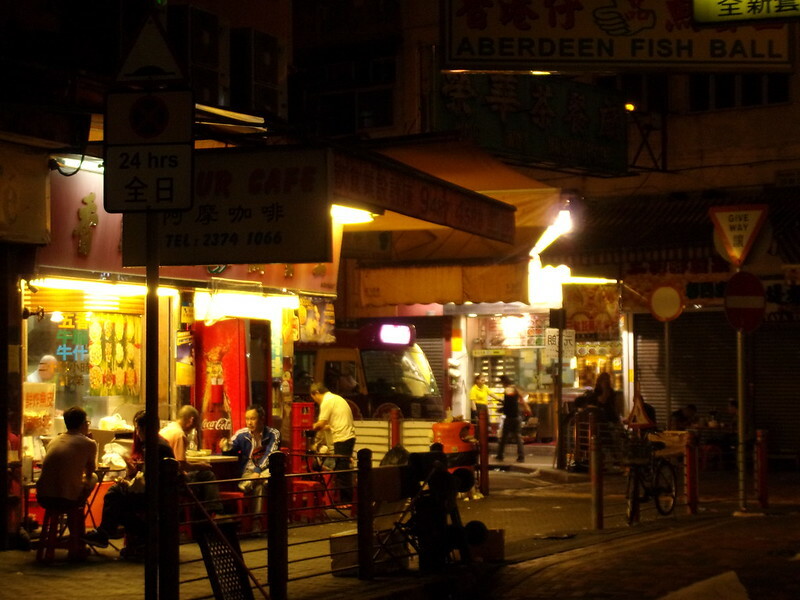 Further down the street was an all-night cafe, and several clusters of men chatted over cigarettes and beer. Occasionally a raucous shout of laughter would fill the air, and it would echo briefly up the walls of the surrounding buildings. I turned away from this scene, finally feeling tired and ready for sleep, and started walking back in the direction of the hotel. As I passed a small garden I noticed a flash of color out of the corner of my eye. 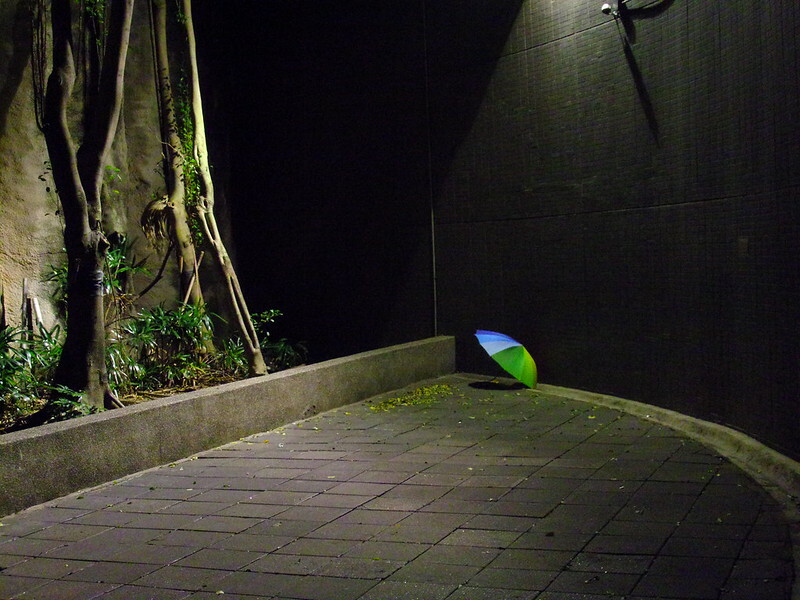 I stopped and looked to my right, and at the very end of the garden was a multicolor umbrella lying on the ground. It seemed as if someone had just left it there for a moment. Above the umbrella was a CCTV camera, pointing right at me. I was captivated by this scene. It was naive and innocent, and yet also eerie and haunting. I noticed a glint of metal coming from a tree near the umbrella; when I looked closer I saw that someone had embedded a golden ring into the trunk. 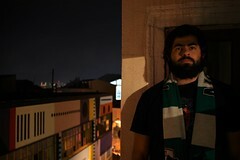 I decided not to tempt fate, and left the place as I found it, then made my way back to the hotel. 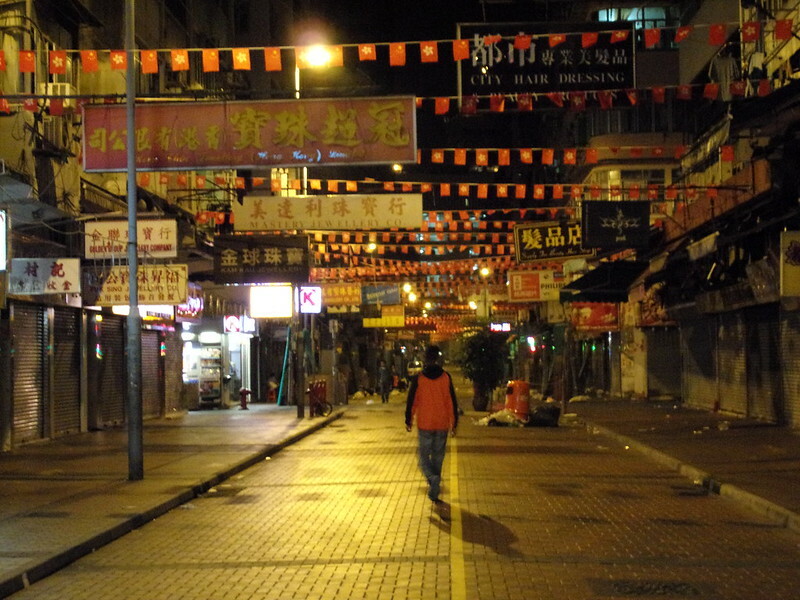 Hong Kong was waking up, but it was time for me to go back to sleep. 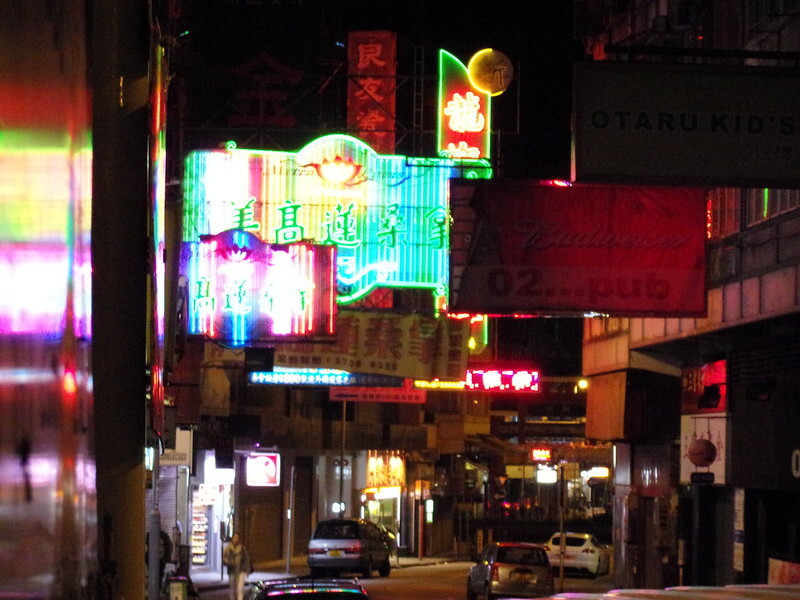 Posted in Beauty, ReflectionTagged cityscape, Hong Kong, Insomnia, late night, neon, nightlife, photography, Reflection, travel, urban, wandering, writingBookmark the permalink.